Overview : The Wireless keypad for the PLAYSTATION®3 system provides the freedom of easy to use texting and mouse input capabilities, all while maintaining full gameplay functionality in one easy-to-hold device. This Bluetooth® device attaches to any DUALSHOCK®3 or SIXAXIS™ wireless controller and enables effortless internet browsing, e-mailing and instant messaging on the PlayStation®Network and PlayStation®Home. The unique touch pad feature allows for convenient scrolling and mouse input on the PS3™ system on-screen display. Dedicated short cut keys provide instant access to ‘Message Box’ and other online communication applications on the PlayStation®Network. By integrating all these features in a sleek and elegant design, Sony Computer Entertainment, plans to further enhance online interactivity on the PLAYSTATION®3 system. QWERTY keypad designed for fast, thumbs-only typing. Touch pad mode turns the main key area into a touch pad. When touch pad button is pressed, user can not use the keys for character input but can slide her finger on this area to select something on the screen. On the internet browser, user can see a cursor when this mode is set on. Dedicated short cut keys provide instant access to text-based communication applications on the PLAYSTATION Network. Automatic pairing with the PS3 system via a USB cable. Charges by connecting it directly to the PS3 system using a USB cable. Quality/Usability : With new generation consoles and online play, theres voice/text chat. But what if you dont have a headset with microphone, let alone wanting to hearing immature people/kids smack talk or their squeaky voice. How about now wanting to suffer selecting each letter with the d-pad or on-screen keyboard? Yes, you can connect a USB keyboard to the PS3 but it so big and requires you to put your controller down. 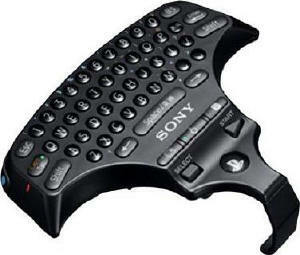 Like the Xbox 360 Chatpad, Sony has released their own QWERTY keypad for the Sony PlayStation 3. The keypad is small, lightweight and fits over the Dual Shock or SIXAXIS controller and is held in place with a spring-loaded clap. On the face of the keypad are your typical QWERTY keypads as well as ESC, TAB, CAPS, SPACEBAR, BACK, ENTER, etc. Also on the keypad is SELECT, START and PS button. But some additional buttons that make it easier for gamers is the ability to view messages and friends list with their own dedicated buttons. With these two dedicated buttons, it cuts down on time and hassle of having to navigate through menus after pressing the PS button. Another nice feature is the touch sensitive keypad allowing gamers to swipe across the keypad surface. But the keypads themselves are a bit small and will require some getting use to. The keypad has its own battery and does not run off the Dual Shock or SIXAXIS power. So this requires a Mini-USB to charge the battery. To use the touchpad, you simply press the button that looks like a pointing finger cursor and the enter keypad becomes a touchpad. The idea is to sweep your finger over the buttons to navigate the XMB or web browser. The concept is nice but fails at what it does due to lack of a smooth surface. Conclusion : Overall, the PlayStation 3 Wireless QWERTY Keypad makes typing a lot easier. However, they keypads are a tad bit small and the touch sensitive keypad isn't as responsive as I would like it to be. Another feature I hoped that they had incorporated was taking power from the controller rather than having its own rechargeable battery. This means another item needs to be charged. Is it worth the $50? Depends on if you're a heavy texter. It would look more eye catching if the MSRP was the same as MS Chatpad ($30).